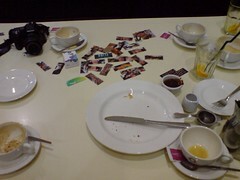 I went along to my first Edinburgh Coffee Morning today at a startlingly early 8am. Met up with Nico on the way who was cycling to work, I should really start doing that. Anyway, the coffee chat was excellent. Talked to lots of different people: designers, developers, teachers, advertisers. It’s an eclectic mix of folks and makes for a good range of topics, generally about web “2.0” (god I’m sick of that term). Let’s see who I can remember: Johnnie Walker, Mike, Ewan, Phil and lots of other people who’s names I can’t remember. I’ll definitely try and make it next week. The Pixar : 20 years of animation exhibition has arrived in Edinburgh. We need to go and see this. Web events seem to be sprouting up all of the place at the minute in Edinburgh! I’m attending the Highland Fling conference in April which sounds very interesting. Refresh Edinburgh has also appeared out of the wood-work to hold an event on the day after Highland Fling. Plus, there is Barcamp Scotland happening in March, based in Appleton Tower no less. Interesting times. Update: Also Web Security Conference Day for Windows Developers from scottishdevelopers.com, thanks John. Last night Kerry and I went to see Jim Henson’s Puppet Improv at the Fringe. It was great! Now, this wasn’t the muppets, as that is a specific off-shoot of the Jim Henson company, this was just a bunch of the Jim Henson trained performers with more of the ‘generic’ puppets. Animals, aliens, cartoony humans and such. The stage was set up in such a way that the performers just did their stuff out in the middle of the stage with the puppets above them. There were various large screens in the auditorium which showed the feed from a fixed camera set looking at the stage, but at the level of the puppets. So you could watch the screens and see the kind of view you get on Sesame Street or watch the stage and see how the performers make the puppets do what they do. With it being an improv show there was a lot of audience partipiation which centered around filthy suggestions and topic which usually got a response of “did that yesterday” and “had that already” from the compére. My favourite sketch was when the audience had to suggest four letter words. Then the assembled puppets had to get from word A to word B by just changing one later at a time in a normal conversation. Needless to say, they got stuck pretty quickly as we chose ridiculously hard words, but that just added to the comedy as the pupppets started sniping at each other. In the end they did manage it but had to resort to a few spanish words and comedy words like “mooo” and “owww”. An excellent show, worth the money, definitely recommended. Joe has a great post about Waterstones decision to break out of it’s (totally insane) e-commerce relationship with amazon. “The new website will embrace employee blogging, a dramatic reversal for the company that emerged last year as the first British company to sack an employee for blogging. Joe Gordon, 37, who worked for Waterstone’s in Edinburgh for 11 years, was dismissed for personal commentary regarding his day-to-day life at the bookstore on his blog. Kerry and I had a Random Day Off on Wednesday this week. It was ace, we totally slept in and then went out into the gorgeous weather for lunch at Howies on Victoria street. I had brocolli and pea soup and then chilli chicken escalope on foccacia, or something. Whatever it was, it was damn tasty. Kerry had corn cakes to start and then some kind of squid thing, which I refused to try in my stuberness. 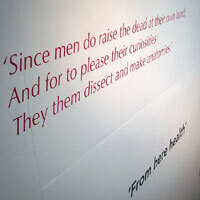 After lunch we went to see the Anatomy Acts exhibition at the City Art Centre. It was pretty cool, rather gruesome, but very interesting. Lots of models and paintings of the insides and outsides of bodies, medical instruments and very old, very elaborate anatomical texts. They even had some doctor chaps wooden operating trolley from eighteen-oh-something that must have seen a fair bit of blood spilt on it, as the wood was a good browny-red shade on top. 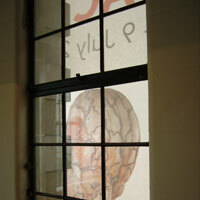 It goes over three floors of the gallery and was a lot larger than I was expecting, especially for a free exhibition. They even have some modern medical imagery stuff from MIR and CAT scanners on a big screen which reminded me of the Visualisation course I did at uni. A great day off, and it made the week seem really short! 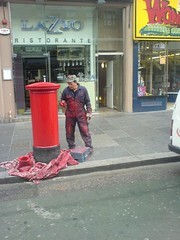 Have You Ever Seen A Man Painting A Post Box?